The search for the 10 best travel mugs was inspired by the desire to enjoy a mug of your favorite beverage or drink without worrying about spillage, it getting too hot or too cold, or having to place it in another place other than the designated cup holder. Driving is already a hassle in itself, so why would you want to make it worse by having to hold a mug or constantly watch over it? The best travel mug will easily fit in your car’s cup holder, maintains the right temperature, and comes with a spill-proof lid. Also, it will be made from a sturdy material; has the right capacity and the liner won’t make the tea, coffee or any other drink taste funny. After reviewing and comparing the available products, we found the following to be the top travel mugs in 2019. Enjoy a hot drink 12 hours after storing it inside the Procizion mug. This stainless steel travel mug will also keep cold drinks cold for as many as 24 hours courtesy of the double walls and vacuum insulation. Other than its strength and durability, 18/8 stainless steel also preserves the original taste, flavor and aroma. The 16-ounce mug is suitable for storing coffee and tea and is ideal for adults, teens and kids. Other merits include 1005 BPA-free, flip-top lid, takes minimal space ,and easy cleaning The key demerits are that the latch and lid clasp aren’t very strong and the wide mouth is not very friendly especially when driving over rough surfaces. 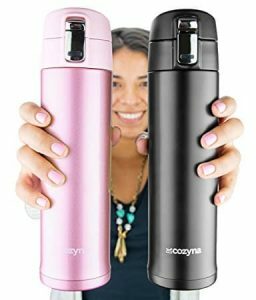 Capable of keeping drinks cold for as many as 24 hours and hot for up to 12 hours, the Cozyna travel mug is among the 10 best travel mugs for 2107. The stainless steel mug features double wall vacuum insulation and won’t affect the taste or smell of tea, coffee or any other beverages even after being stored for many hours. Its 16 oz. capacity is perfect for normal use while its pink and black color make it trendy and stylish. Shoppers love its good temperature retention, no aftertaste, easy cleaning and compatibility with most vehicle cup holders. But, the mug doesn’t score well in regard to being 100% leak proof or suitability for a heavy coffee or tea drinker. 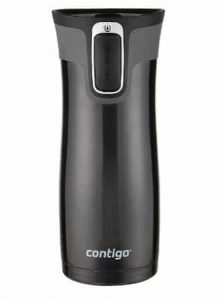 Courtesy of its Patented Autoseal lid, the Contigo Autoseal Bella is 100% spill and leak proof. 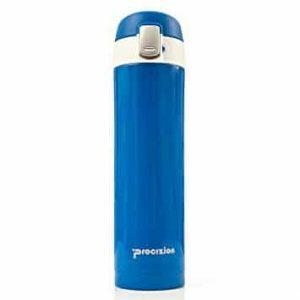 The plastic-made travel mug comprises of double wall and vacuum insulation that keep cold things cold and hot beverages hot for several hours. For ease and convenience, it features one-handed design and easy open & release button that automatically seals the contents ensuring there is no spillage or leakage. The mugs strong points include sleek design, BPA-free, FDA-approved, light and minimal condensation. Unfortunately, the plastic isn’t as strong as stainless steel, the lid may open when dropped from a high height and it isn’t 100% dishwasher safe. 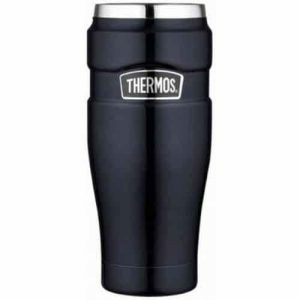 This travel mug by thermos has a capacity of 16 ounces and its exterior and interior are made from stainless steel. It comes with a handle for added convenience and tight drink lock lid that ensure no spillage or leakage. The King mug is based on TheMax vacuum insulation that ensures its double walls retain the temperature for the longest time possible. Other than remaining cool-to-touch, the outer surface remains free of sweat and condensation. Buyers appreciate the mug for its ultra-durability, ergonomic-design, easy maintenance and cool -touch surface. Notable drawbacks is the mug isn’t dishwasher safe, may get dull when washed with scrubbers or abrasive cleaners, and isn’t the cheapest. This 16-ounce travel mug will keep your beverage hot or cold for several hours. It’s made from stainless steel, features non-sticking coating and maintains the ideal temperature courtesy of vacuum insulation. Many consumers praise the item for its flip-open lid that provides a tight seal, the easy-to-clean interior, safety lock that prevents accidental opening, its light weight and compactness. However, consumers claim that dissembling the unit isn’t very easy and sediments from powdered/creamed beverage may accumulate inside if not thoroughly cleaned. 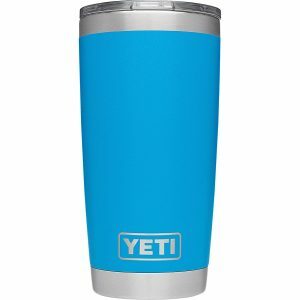 With this Tahoe Blue-colored tumbler, you won’t worry about your drink or beverage losing its temperature. It features a double-wall vacuum insulation for keeping cold drinks cold and hot drinks hot for several hours. The accessory is very sturdy and durable thanks to the stainless steel constriction. The tight lid ensures the contents don’t leak whereas the good design and grip improve handling and convenience. The Duracoat color doesn’t fade, corrode, rust, crack, or peel. Key positives of tumbler include good insulation, sturdy construction, elegant, and good capacity. The tumbler is, however, a little costly compared to other units. 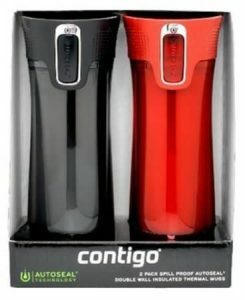 The Contigo snapSeal Byron is suitable for any kind of travels and comes with a 20-oz capacity. 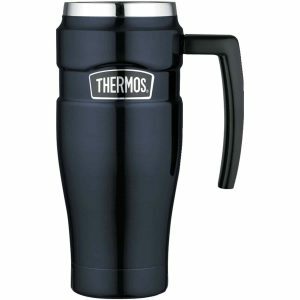 The stainless steel mug will keep drinks cold for about 20 hours and hot for about 7 hours courtesy if the Thermalock vacuum insulation. Its one-handed design makes drinking easy and the “Seal it in” lid ensures there is leakage. Some of its main pros include compatibility with most cup holders, user-friendly design & grip, 100% BPA-free and easy cleaning. Unfortunately, screwing and unscrewing the lid is not very easy as claimed by some consumers. Courtesy of vacuum insulation, the Zojirushi SM-KHE48AG travel mug will keep your hot beverage hot and cold beverage cold for many hours. The mug is made from 18/8 stainless steel and includes a highly-polished interior. It has a 16-ounce capacity and a wide mouth that easily accommodates full-size ice cubes. Durability, elegant, good temperature retention, safety lock and compact design are some of its good points. Unfortunately, the lid spring is a bit weak and cleaning the interior is somewhat challenging. The King food jar by thermos is double-walled and made out of durable stainless steel. 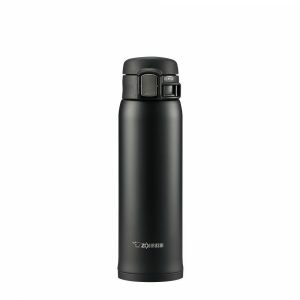 Its 16-ounce capacity is ideal for daily usage and is suitable for both hot and cold beverages. The travel mug depends on vacuum insulation to keep beverages cold for as many as 9 hours and hot for up to 6 hours. Its cold touch surface guarantees a user of comfort while minimizing any sweating or moisture buildup. Consumers love this mug because its light, has good capacity (0.47 liters), easily fits in most cup holder, and the built-in tea hook. However, it consists of too many parts that make cleaning a bit tasking. 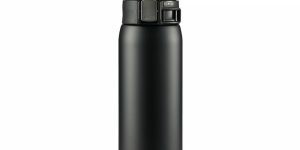 This travel mug is made from stainless steel and will fit in the cup holders of most car and trucks. It uses vacuum insulation to keep drinks cold for up to 18 hours and hot for as many as 7 hours. The 20-oz mug has an easy-to-clean and leak proof lid and button lock to keep everything intact even while driving on rough/bumpy surfaces. Its main advantages include the one-handed holding design, spill & leak-proof, dishwasher safe and 100% BPA-free. Notable cons include its fairly high price and fast fading. Choosing the right travel mug is key to enjoying your ride. The above mugs are made from sturdy materials that will withstand daily usage, feature spill-proof lids that ensures you enjoy your drink to the last drop , and will perfectly fit in the car’s or truck’s cup holder. Additionally, the mugs are ergonomic and comfortable to hold, feature a hygienic liner that won’t interfere with the taste and aroma of your beverage and are available in different sizes ranging from 8 to 20 ounces. So there you have it- the 10 best travel mugs for 2018. Have you made a choice?